The extension, named Secretbook, was one of student Owen Campbell-Moore’s research projects, and presents a novel way for users of the social network to hide messages inside Facebook photos. It does require both the uploader and the intended recipient to have Secretbook installed, but the process, which uses JPEG Steganography to tweak the data within a photo (making barely any perceptible alterations to the image itself), works incredibly well. All data is stored within the image file (rather than the image per se), so even if you have 20/20 vision and squint a lot, you won’t find the hidden text unless you’ve the password set by the uploader at the original point of encryption. Sending “secret” messages so apparently publicly seems like a recipe for disaster, but in actual fact, it’s perhaps more secure than using the inbox feature, since only those with the password would be able to see the secret message. Once the extension is installed, you simply press CTRL-ALT-A at the same time, and Secretbook is fired into action. A pop-up appears, notifying you of how many characters the image can hold. It seems the limit tends to fall just short of the 140 character cap imposed by Twitter, so this extension could, in essence, become something of a “secret Twitter” for you and your friends. 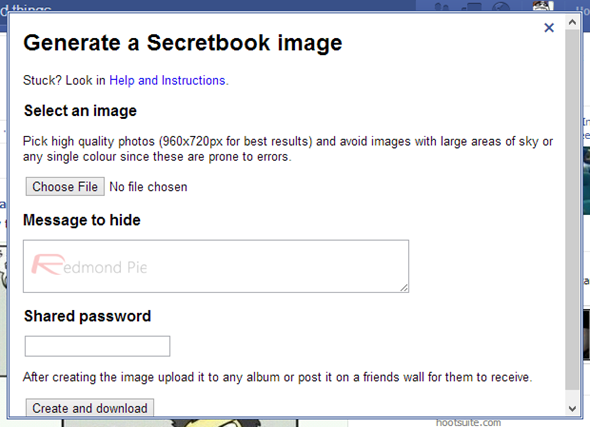 If you want to give Secretbook a try, grab it from the link below (requires Chrome), and let us know how you find it by dropping a comment via the usual mediums.